Lok Sabha Polls: Congress leader Shashi Tharoor was injured during a ritual on Monday. He received six stitches on his head. General Election 2019: "I am happy to see Shashi Tharoor back in action," Rahul Gandhi said. 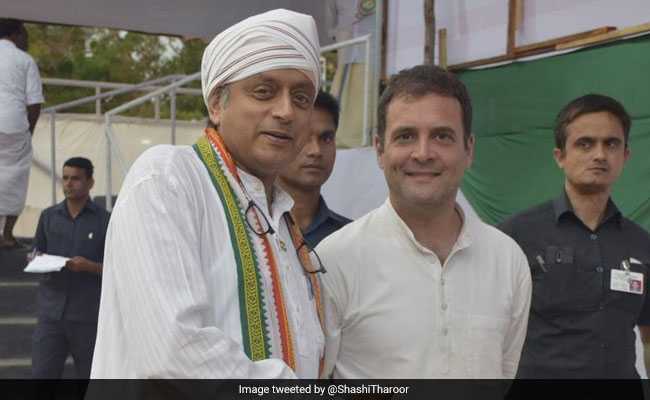 At an election rally in Thiruvananthapuram on Tuesday, Congress president Rahul Gandhi praised party leader Shashi Tharoor's spirit for joining him in his campaign despite suffering head injuries during a temple ritual a day ago. Shashi Tharoor, who is seeking to be re-elected from Thiruvananthapuram, was seen with a scarf covering his head. Shashi Tharoor had also tweeted a picture of him with the Defence Minister and said "Civility is a rare virtue in Indian politics - great to see her practice it by example!"